Description: Eastbound on the ex-NYC mainline near sunset at Pine Junction. Description: 18G enters New Jersey with noise and smoke as the engineer play catch up with the stack train ahead. Description: Eastbound at Cove, PA MP 117 on the NS Pittsburgh Line. Title: WB 11J With BNSF @ 0857 hrs. Description: Just behind 21M was WB 11J which also had a BNSF unit trailing D9. Description: NS 76M is black and blue from hauling all that coal. Description: NS 14K, able to approach! Description: Westbound on track three with a trio of Dash 9s. Description: EB autorack, 18th Avenue. 0815 hours. Description: NS 9259 and another D9-40CW are power for this days 62R. Description: 62R with it's 50 loaded rock cars battles the hill as it heads eastbound. 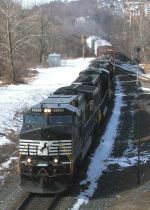 Description: Westbound freight train assisted by two rear end Helpers exits the Gallitzin Tunnel. Description: Eastbound mixed freight NS 14G rounds the curve at Gallitzin.